Parent and Child Group meeting today in the Marvell-Elaine Elementary School, in room #107 at 5:30 p.m.
Marvell-Elaine School District will be closed Friday April 19, 2019 for Good Friday. Classes will resume Monday April 22, 2019 and the Marvell-Elaine Elementary students grades 3-6 will begin taking ACT Aspire Summative. Please encourage students to do their best!!! Marvell-Elaine High School 21st Century Fun and Educational Day tomorrow Saturday April 13, 2019 from 7:30 am to 3:30 pm for grades 6-12th. Come out and enjoy the festivities. Marvell-Elaine School District Spring Football starts Monday April 15, 2019 and attendance is mandatory. Marvell-Elaine School District after school has been cancelled for today due to potential flooding of the roads. Marvell-Elaine School District parents please send bottle water with your children until the boil water watch is lifted thank you in advance. Marvell-Elaine Students (Only) will be dismissed at 1:30 today due to a city wide water boil alert. Marvell-Elaine School District Parent Teachers Conference is today from 1:30 pm to 7:30 pm at the Marvell-Elaine High School and Elementary School. Community Meeting today Tuesday, March 12th at the MEES Cafeteria at 6 pm. Community Meeting Today Monday, March 11th at 6:00 pm at the Vo-Tech Building in Elaine. Community Meetings: Monday, March 11, 2019 Vo-Tech Building in Elaine at 6 pm. Tuesday, March 12, 2019 MEES Cafeteria at 6 pm. District 1A Coach of the Year is Coach Galdric Thrower Congratulations!!! Congratulations to Marvell-Elaine High School 2018-2019 Teacher of the Year Ms Lateil Albert! Congratulations to Marvell-Elaine School District 2018-2019 Teacher of the Year Ms Nicole Davis! Marvell-Elaine School District will be having a Black History program today February 28 2019 at 5:30 pm at the Marvell-Elaine Elementary Cafeteria. Please come and be our guest. Congratulations to the Coach Thrower and his staff and the MESD Senior Boys Basketball team " Mustangs" on their win tonight to become the District Champions. Marvell-Elaine School District will be closed Monday, February 18, 2019 for President Day. Have a great and safe weekend! MESD and Eastern Arkansas Family Health Centers community meeting will be tomorrow Wednesday February 13 at 6:00 pm in the Marvell-Elaine Elementary Cafeteria.There will be free food and door prizes. Please come out and learn more about the MESD School Based Health Center. Senior Night tonight Feb 1, 2019 Brinkley vs Marvell at 5:00 pm. Marvell vs Bradford today January 29, 2019 at 5:00 pm there. Marvell-Elaine School District Community meeting will be today January 28, 2019 in the Marvell-Elaine Elementary Cafeteria at 6:00 pm. Marvell-Elaine School District Community meeting will be Monday January 28, 2019 in the Marvell-Elaine Elementary Cafeteria at 6:00 pm. Augusta vs Marvell today January 18, 2109 at 5:00 pm. Marvell vs Lisa Academy (North) today January 11, 2019 at 5:00 pm. Jan 8-Marvell vs Brinkley (Conference Game) at 5:00 pm. Correction on Marvell-Elaine School District Early Dismissal. Early Dismissal today December 19, Thursday’s December 20th and Friday December 21st at 1:30. We apologize for the confusion from the earlier alert that this may have caused. Marvell-Elaine School District Early Dismissal Wednesday January 19, Thursday January 20, and Friday January 21st at 1:30 pm. Christmas Break begins Monday December 24 - January 4, 2019. Classes will resume Monday January 7, 2019. Marvell-Elaine School District Veteran's Day Program will be Wednesday Nov. 28th at 5:45 pm in the Marvell-Elaine Elementary Cafeteria. All Veterans are welcome and the public is invited. Quest Academy vs Marvell 11/16 at 5 pm at the Central High School Gym. Marvell-Elaine School District will be open today. Marvell-Elaine School District will be closing today at 1:30 pm due to inclement weather. ATTENTION! ATTENTION! ATTENTION! Lisa Academy vs Marvell Basketball game will be played at the Central High School Gymnasium 103 School Rd. West Helena, AR. 72390 today at 5:00 pm. All of Marvell-Elaine home basketball games will be played in the Lake View Gymnasium of the former Lake View High School unless otherwise informed. The Marvell-Elaine Elementary School telephone number is no longer (870) 829-2946 that is the School Health Base Center number. The Marvell-Elaine Elementary number is (870) 829-1341. Just A Reminder: Marvell-Elaine School District School Wide Rally Tomorrow Oct. 30, 2018 at 2:45 pm in front of the Marvell-Elaine High School. Marvell-Elaine School District School Wide Rally Oct. 30, 2018 at 2:45 pm in front of the Marvell-Elaine High School. The Marvell-Elaine School District Students will be out on tomorrow October 12th due to Professional Development. The Marvell-Elaine School District will be closed October 15th for fall break. You are invited to the Marvell-Elaine School District School Based Health Center Ribbon Cutting Ceremony. Thursday Oct. 11, 2018 at 2:00 pm. The ceremony will begin in the Marvell-Elaine Elementary Cafeteria. Please Come Out and Join Us. Jr High Football game scheduled for tomorrow night at 7 pm at the Mustangs Stadium has been rescheduled for a later date. Will post date as soon as it becomes available. Marvell-Elaine is a Community Eligibility Provision (CEP) School District. Parents Educational Meeting.​ Saturday, Aug. 18th at 11:00 a.m.​ at M.M. Tate, 307 Willis Dr.​ Sponsored by the Urban League of the State of Arkansas & Marvell-Elaine School District. Sherman Tate, Board Chair of the Urban League will be the facilitator. Lunch will be provided. MEJH and MEHS football players need to report to practice on Monday August 6, 2018 at 5:00 pm. Marvell-Elaine High School Registration July 25 from 8:30-3:30 and July 26 8:30-6:00 at the Marvell-Elaine High School for all 7th-12th Graders. District Wide Dress Code Meeting for all Marvell-Elaine School District parents and students. Thursday July 26, 2018 at 5:00 pm in the Elementary Cafeteria. Marvell-Elaine School District Summer School is open to grades 6-12 starting June 5-July 2. For more information call Marvell-Elaine High School (870) 829-1351. 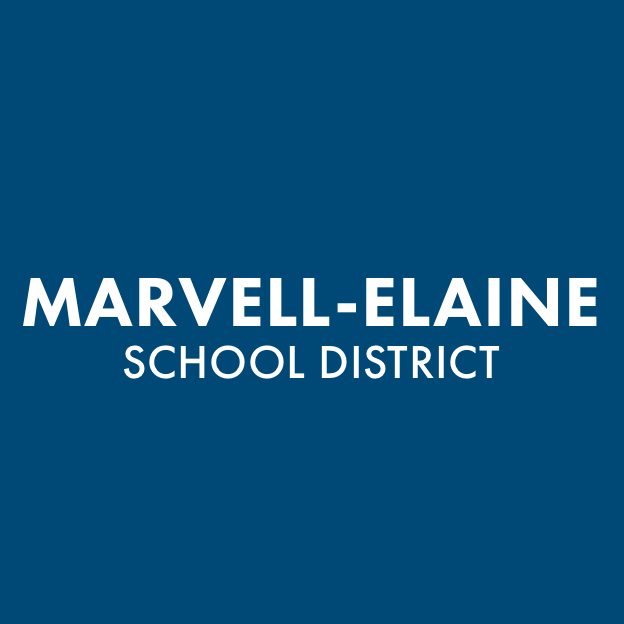 Last day of regular school for the Marvell-Elaine School District Students is June 4. 21st Century Summer School starts June 5. Marvell-Elaine School District will have early dismissal for students at 1:30 starting Wednesday, May, 30 til Monday, June 4, 2018. Marvell-Elaine School District will be closed Monday May 28, 2018 for Memorial Day. Classes will resume Tuesday May 29, 2018. Marvell-Elaine School District will do an early dismissal today at 1:30. Marvell-Elaine High School Graduation will be May 18, 2018 at 7:00 pm in the Marvell-Elaine High School Gym. Marvell-Elaine Preschool Graduation will be May 16, 2018 at 10:00 am in the Marvell-Elaine Elementary Cafeteria. Marvell-Elaine High School Progress Reports will be given out to students Friday, April 27, 2018. Congratulation to Coach Galdric Thrower and the JR & SR track boys for being the 2018 1A-5 North District Champions! Marvell-Elaine High School Parent meeting will be held April 19, 2018 at 6:00 p.m. in the Marvell-Elaine High School Cafeteria. Marvell Elaine School District will be closed tomorrow March 30 for Good Friday. School will resume on Monday April 2. Celebration for Maya Angelou April 4 from 9:30 am to 11:30 am in the Marvell Elaine High School Gym. The Community is Invited. Congratulations to 7th Grader Shamyah Brown for being March student of the month. Marvell-Elaine School District Board Meeting tonight at 7:00 pm at the District Administration Building. Marvell-Elaine School District Students will be dismissed tomorrow March 15, 2018 at 1:30 pm. Marvell-Elaine School District Parent Teacher Conference is March 15 from 1:30 pm to 7:30 pm. Tomorrow March 9 is Professional Development for Marvell-Elaine Staff. There will be No School for the Marvell-Elaine Students tomorrow March 9. Motivational Speaker "Issac Joseph" will be at the MESD at 1:30 speaking to the MESD K-12 students on February 22 in the high school gym. MESD Parent Night & Black History Program February 22 at 5:45 in the Elementary Cafeteria. Marvell-Elaine School District will be closed Monday February 19, 2018 for President's Day. Congratulations to the Marvell-Elaine Jr High Basketball Team for winning 1A/2A District Tournament! Mustangs vs England today Feb 1 at 4:30 there. Last home game of the season Clarendon vs Mustangs tonight January 30 at 4:30. Marvell vs Jacksonville today at 4:30 there! Mustangs vs Carlisle at 4:30 today January 26, 2018 there. Senior Night Palestine Wheatly vs Marvell today at 4:30 at the Home of the Mustangs. Hazen vs Marvell today at 4:30 at the Home of the Mustangs. Lisa Academy vs Marvell today at 5:00 at the Home of the Mustangs. Carlisle vs Marvell today at 5:00 at the Home of the Mustangs!!! Marvell-Elaine School District will have school tomorrow January 19, 2018. Marvell-Elaine School District will be closed Thursday January 18, 2018 due to hazardous road conditions. Marvell-Elaine School District will be closed Wednesday January 17, 2018 due to hazardous road conditions and expected overnight freezing temperatures. Marvell-Elaine School District will be closed today January 16, 2018 due to inclement weather. Just a reminder Marvell-Elaine School District will be closed tomorrow Monday January 15 for Martin Luther King Holiday. Marvell-Elaine School District will be closed today due to inclement weather. The scheduled basketball game against England tomorrow will be here in Marvell-Elaine gymnasium starting at 4:30 pm. Marvell-Elaine School District will be open tomorrow Jan. 4, 2018 for staff and students. Marvell-Elaine School District will be closed Jan 3, 2018 due to frozen pipes. Tonight's basketball game Carlisle vs Marvell at the Marvel-Elaine High School has been cancelled. Early Dismissal for the Marvell-Elaine School District Students Dec. 15th, 18th and 19th at 1:30. Marvell-Elaine School District Parent Meeting/Veteran's Day Program will be Nov. 16 at 6:00 at the High School Cafeteria. Hope to see you there! Marvell Elaine School District Title I meeting will be held tonight at 6:45 pm to 7:45 pm at the Elementary Cafeteria. Marvell-Elaine School District Annual Report to the Public will be held tonight at 5:45 pm to 6:45 pm in the Elementary Cafeteria. The Basketball games schedule against the Barton Bears Nov 14 and Nov 16 of this week have been cancelled. Correction on Early Dismissal for Nov. 10 the Marvell-Elaine School District students will be dismissed at 1:30 not 11:30. Tomorrow only! Will be Pink Out Day for all students and staff. So please wear some pink tomorrow for the last day of Breast Cancer Awareness! Marvell-Elaine School District Parent Teacher Conference is Oct 19, 2017 from 1:30 to 7:30 pm. Students will be dismissed at 1:30. Looking forward to seeing you! Mustangs Jr. & Sr. High Football team will play the Des Arc Eagles today in Des Arc, Arkansas. Jr High game starts at 6:00 pm and Sr. High game will follow. Don't Forget! Marvell-Elaine High School Parent Meeting tonight at 6:00 pm in the Marvell-Elaine High School Cafeteria. Hope to see you there! Marvell-Elaine High School Parent Meeting Tomorrow at 6:00 pm in the High School Cafeteria. Don't forget to Vote Yes today! Extending our current bonds will provide new construction and new buses for Marvell-Elaine School District. Please support the future of our children. Mustangs vs Cougar Cats football game for today has been cancelled! Mustangs vs Cougar Cats Tonight at Cad Polk Stadium at 6:30 pm. Community Meeting tomorrow September 12 at 6:00 pm in the Marvell-Elaine Elementary Cafeteria. Please Come Out and Hear What is happening in Marvell-Elaine School District. Hope to see you there! Are you ready for some football Marvell-Elaine Mustangs vs Barton Bears tonight at 7:00 at Barton. The Marvell-Elaine School District Community Meeting for tonight has been cancelled until further notice. Community Meeting tomorrow evening Aug. 31st at 6:00 pm in the Marvell-Elaine Elementary Cafeteria. Please Come Out and Hear What's Happening in the Marvell-Elaine School District. Marvell-Elaine Professional Development Sign In and Continental Breakfast for 8/7/2017 will be 7:30 am to 8 am. Registration is still going on today at Marvell-Elaine High School from 8 am to 6 pm. Please come out and register your child. If you have already registered we thank you. Marvell High School Registration continues August 2 from 8 am to 3 pm, August 3 from 8 am to 6 pm and Friday, August 4 from 8 am to 6 pm.